Strand is a small town on the False Bay coast, about 40 minutes drive from Cape Town.While the town has undergone many developments in recent years, at its heart it is still a beach town. As with many coastal settlements in South Africa, Strand started out life as a fishing village. However, as time passed, the village grew and metamorphosed into a small city. In fact, with the growth of both Strand and its neighbours Somerset West and Gordon's Bay, the boundaries of each town are blurred forming instead what seems like one large extension of Cape Town. Obviously each maintains its own personality though. 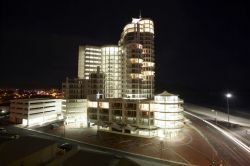 Economically speaking, Strand has a large industrial area, and in recent years, the beach front architecture has taken a move towards glistening skyscrapers as opposed to quaint beach cottages. However, it retains many good holiday town traits, not least of all its beach, Melkbaai. Melkbaai is touted as one of South Africa's safest beaches, with generally small waves and no dangerous undercurrents. 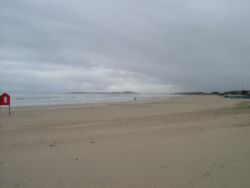 It is also very pretty with 5km of white sand stretching along the coast. While the heart of Melkbaai is a swimmers' beach with small waves, Strand is renowned for having excellent off shore surf breaks as well as numerous other surf spots closer to land. 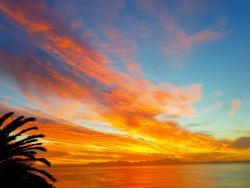 Attractions nearby to Strand include the beautiful, winding coastal road which follows the curves of the mountain from Gordon's Bay through to Rooi Els. Not only does this route provide exquisite views but during whale season, when the Southern Right whales enter the bay to mate and calve, the roadside layby's provide excellent vantage points to view these magnificent creatures from. The harbour in nearby Gordon's Bay has a number of boat charter companies which will take you out for a sunset cruise, while Stellenbosch and it's wine estates are just 25km from the centre of Strand. Strand makes a great base for a summer break, and you have a range of options from tall hotels to small guesthouses and B and B's. If you're looking for a seaside escape, consider this small town. A quick look at our website will give you the information you need to make your choice. 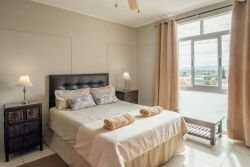 You will find reviews and you will also be able to compare prices and find wonderfully affordable accommodation in Strand. Are you planning the perfect getaway but have not yet found your ideal Strand accommodation? By using our easy website, you can find great accommodation of all types, whether it is a cosy bed and breakfast or a comfortable lodge. We have thousands of easy to find listings for self-catering facilities, holiday homes, guest houses and hotels as well as backpackers, chalets, caravan facilities, villas and apartments, giving you a wide variety of options when it comes to your accommodation in Strand. To help you find the right place to stay, we have a number of tools that you can use, including a map. This will help you to pin point exactly where you will be staying and it will show you the accommodation facilities that are closest to where you will be. Regardless of the reason for your visit to Strand, we can guarantee that you will find the type of accommodation you are looking for. 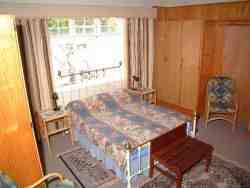 But reviews for Strand accommodation is not the only information you will find. Want to know if your Strand accommodation is pet-friendly or allows smoking? All of that information is included on the listings page. You will also be able to find which activities are on offer and the sort of amenities included with each room. All of this information will help you to make an informed decision before you make any payments to, giving you more peace of mind about your choice. We include all of the contact details of the self-catering accommodation, holiday homes, guest houses and hotels as well as backpackers, chalets, caravan facilities, villas and apartments in Strand which are featured on this website, so you also have the option of getting directly in touch with the place. 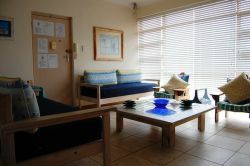 Regardless of where you are staying, we feature Strand accommodation in that area of the province. You have options of Strand guest houses, lodges and bed and breakfasts, among others, ranging from your more affordable, lower prices to your more luxurious options. So, you are not visiting for a holiday but rather for business and all you need is a place to stay for a night or two? The bed and breakfast options, as well as the lodges, are generally preferred by business people and you will find all types, from your more luxurious lodges to your simple, self-catering bed and breakfast. Each will give you a safe roof over your head while you are in the province. 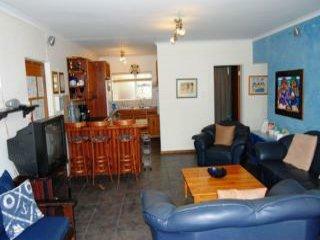 Strand accommodation is not only affordable but well situated. If you are doing business in this area, this is a great accommodation choice. Spending more than a few days in the province? Perhaps you are indulging in a tour of the region and you are looking for a few places to stay? Browsing through our listed self-catering accommodation, holiday homes, guest houses and hotels as well as backpackers, chalets, caravan facilities, villas and apartments in Strand will give you all of the information you need to make your selection. And once you have found the ideal place to stay, you can either request a quote or make your booking directly on this website. Sleeping-OUT.co.za is designed to make finding and booking accommodation in Strand easier than your traditional methods of sourcing a place to stay! 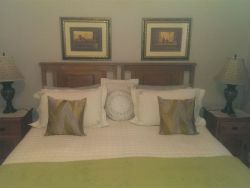 We include some great accommodation special deals in and around Strand.